We have plans to improve services for people who experience poor mental health. 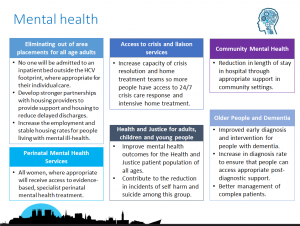 We are working towards ensuring that mental health problems are given the same prominence as physical health problems in the planning and delivery of local health and care services. In keeping with our broader aims and ambitions, we want to put in place programmes and systems that will help people to stay well and manage their conditions confidently. We will improve the care and support available in the community and work to reduce the length of time people stay in hospital. 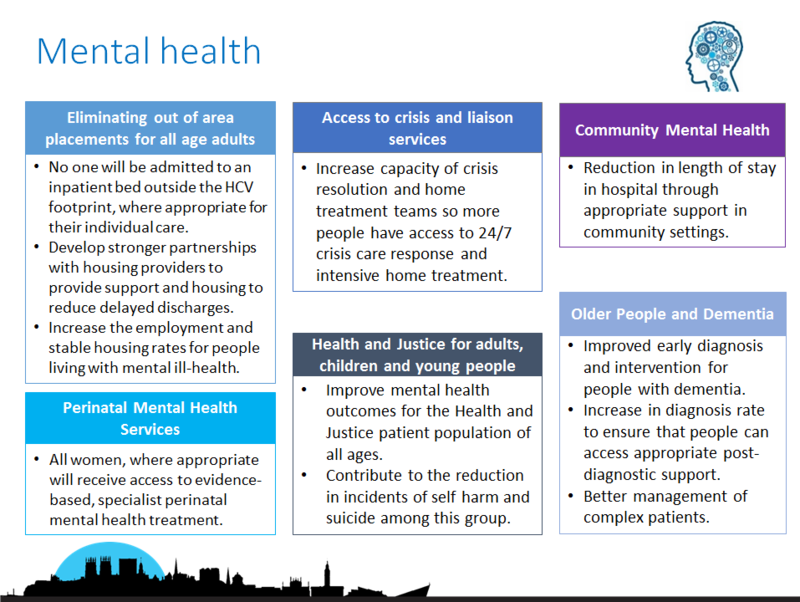 We will work with local councils and the voluntary sector to improve housing and job opportunities for people experiencing mental ill-health. We will create new services to avoid unnecessary hospital stays, such as the introduction of crisis pads, which provide a calm, safe, environment for people experiencing crisis or distress.